This flag had to wait a long time before it's moment finally became 'official.' It was first adopted on November 28th, 1975* when independence from Portugal was declared- independence which lasted a whole nine days before Indonesia invaded and occupied the country. It took until May 19th, 2002 for independence to be won again and the Timorese didn't change their flag in the interim occupation- they raised the original one right back up there once they finally had their freedom. The Indonesian invasion and occupation was brought on by what else? A fear of communism- with civil war threatening to break out between the two main political parties (FRETILIN and the UDT) Indonesia played the Cold War cards and invaded with predictably brutal results. Between 1974-1999 the Commission for Reception, Truth and Reconciliation in East Timor cited at least 102,800 conflict related deaths. Of course, it being the Cold War, the United States supported the Indonesian invasion. The Santa Cruz Massacre of 1991 proved to be a major turning point for the Timorese cause and by 2002, independence was secured. Some instability followed in the first decade of independence, but the UN wrapped up it's peacekeeping mission in 2012. Triangles play a big part in the design of the flag and they've got meanings as well: the black triangle represents "the obscurantism that needs to be over come" (and yes, I took that direct from the Wikipedia page because I think it's the most oddly specific definition of a design element I've come across to date. 'Obscurantism.' I like that.) The red in flag represents the struggle for national liberation. The yellow triangle represents 'the traces of colonialism in East Timor's history.' (Again, straight from Wikipedia, because again, I like the level of detail here.) The star is the light that guides and is white to represent peace. 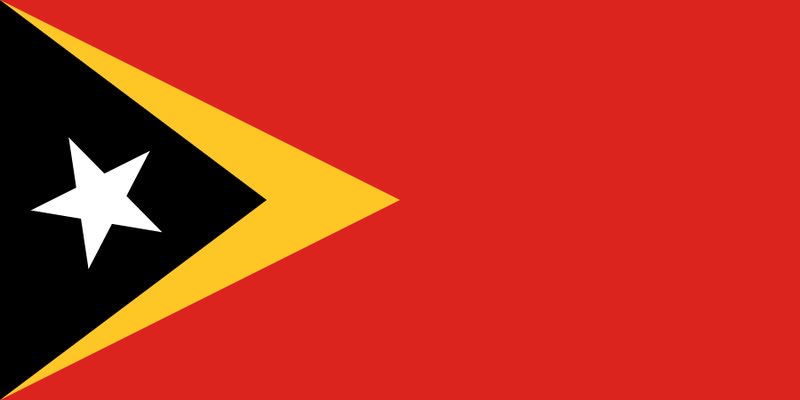 And that, ladies and gentlemen is the flag of East Timor. *Let's talk about imperialism for a second. Look, there's no good justification for invading and occupying a ton of countries that weren't yours to begin with. The vomit inducing justifications like 'spreading Christianity'- which I guess worked in the case of East Timor as it, along with the Philippines are the only two Christian nations in the region0 or the White Man's Burden were perfectly normal at the time, but still... if you're going to do it, then you have a responsibility to de-colonize in an orderly fashion. After the end of the fascist regime in the Carnation Revolution of 1974, Portugal pretty much said 'see ya!' and walked out the door. Transitional arrangements when compared with the other old European powers were nil and a bunch of countries have very fucked up histories because of the speed and haste of the decolonization. I'm not saying I blame Portugal entirely: their Fascist Dictator Salazar and his short-lived successor Marcelo Caetano had poured blood and money into trying to hold onto their colonies and was in large part overthrown by officers who had spent their careers fighting insurgencies in countries that just wanted them gone. But still... you have to wonder if maybe, just maybe, a little less haste on the part of the Portuguese might have lead to some different outcomes for several countries. Including East Timor.